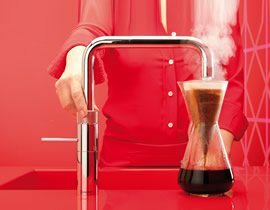 The Quooker should be a must have addition to every kitchen, delivering boiling hot water on demand. No more unnecessary worktop clutter, no more wasted time at the kettle and no more wasted energy boiling too much water for just one cup of tea. The Quooker really does revolutionise the kitchen. The Quooker is available in four different designs and six different finishes so whatever style your kitchen there is a Quooker to suit. The unique small and compact tank measures just 15cm in diameter and the patented vacuum ensures running costs at 3p per day. With child proof safety built in its a win win situation being eco efficient in terms of energy and water usage.